Having a good breakfast is important to jump start your day! Now you can enjoy and indulge in healthy, probiotic, dairy-free yoghurt packed with coconut goodness with Raglan Coconut Yoghurt! Raglan Coconut Yoghurt has been a hit among many as this coconut yoghurt boasts versatility. Served in the iconic Raglan Coconut Yoghurt jar to prevent plastic wastage, this delicious treat can be incorporated in breakfast, smoothies, baking, or eaten on its own as a healthy snack. Ensuring only the best for the brand’s ‘yoghurteers’, the coconuts used to produce Raglan Coconut Yoghurt are grown organically without any fertilisers, sprays or pesticides. 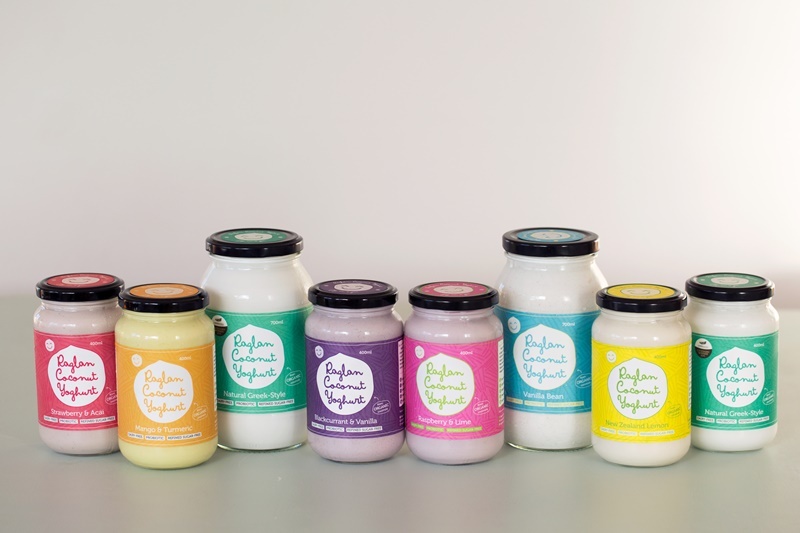 This probiotic, sugar-free yoghurt available at FairPrice Finest, bringing to Singapore five flavours. (Natural, Lemon, Strawberry, Blackcurrant, Mango). It has a shelf life 3 weeks, and 10 – 14 days after opening. 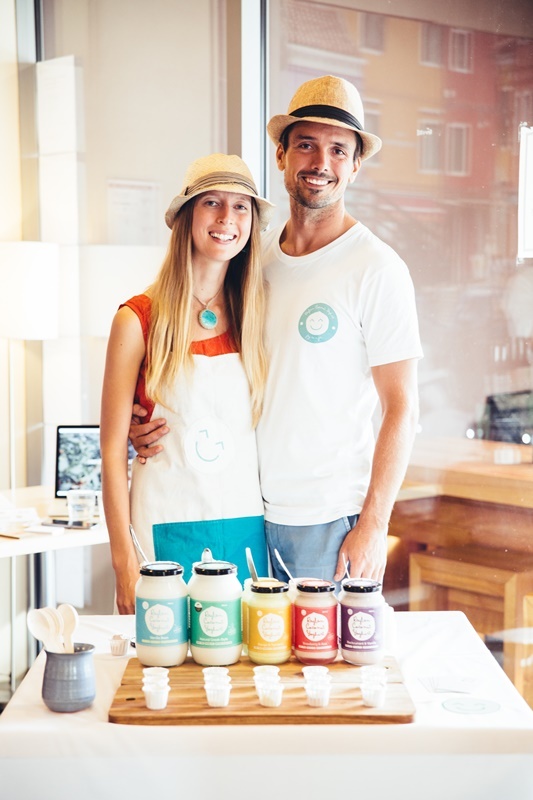 Our Parenting World – OPW Media Team is pleased to interview Tesh Randall and Seb Walter, founders of Raglan Coconut Yoghurt from Raglan, New Zealand to find out more. The delicious dairy-free yoghurt is made from one of the couple’s favourite foods – coconut. More about Tesh Randall and Seb Walter, they are a couple, Seb is lactose intolerant, and suffered from allergies to dairy. Tesh then decided to take the reins and after much trial and error, created Raglan Coconut Yoghurt. As active volunteers, Tesh and Seb have participated in beach clean ups, tree planting, and love to recycle, which explains why Raglan Coconut Yoghurt is served in glass jars. In its short life, the business has won several awards. 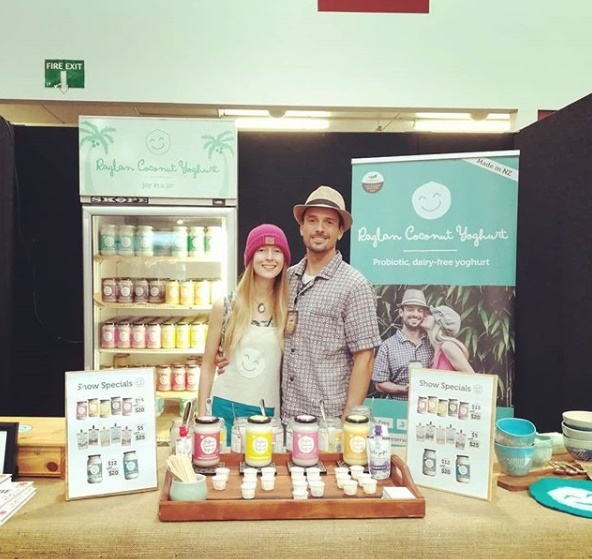 Raglan Coconut Yoghurt won the Gourmet and People’s Choice categories in the 2015 NZ Food Awards and the Micro Business category in the 2016 Westpac Waikato Business Awards. Their best-seller, Natural flavour, is a creamy coconut yoghurt made from 100% organic coconuts, and has the tangy taste of greek-style yoghurt. It’s dairy-free and packed with probiotics for happy yoghurt-eers. Their coconuts are imported from an organic plantation in Sumatra. 1. Please share with us about your background and your vision for Raglan Coconut Yoghurt? Seb and I moved to the sunny surf town of Raglan nearly 6 years ago to slow down, spend more time in nature, and run our digital agency helping sustainable, ethical brands (The Good Agency) from home. I am also the editor of Arrival Magazine, and love writing children’s books, my latest published book is ‘Abigail Knightly’. We didn’t plan on starting a yoghurt business, but we’re very excited to be part of the movement towards plant-based eating and giving people a yoghurt option that is better for their health & the planet than the current dairy yoghurts on the market. I’m the people person and Seb’s the brains of the operation! We are very lucky to have different but complementary personality types. He’s amazing with systems, numbers, and strategy. All the processes, financial side of things and general master-minding is Seb’s department. I look after our stockists, go to expos showcasing our yoghurt, manage our social media and handle all other marketing. Our vision is to help accelerate the shift towards a plant-based diet for humankind. 2. What inspired you to come up with Raglan Coconut Yoghurt? Mr Coconut and I have always been big yoghurt fans. We loved Greek-style yoghurt and had it on our breakfast, in smoothies, and with dessert. But we started noticing that Seb was reacting to the yoghurt (and other forms of dairy) – he would have a snuffly nose and feel almost like he had a cold after eating it. So I thought I’d look into other options. When I heard it was possible to make coconut yoghurt, I thought I’d give that a go. It took about 3-4 months before I really nailed it, yoghurt is such a sensitive product. But soon enough we had a creamy, delicious dairy-free yoghurt! We offered some extra jars for sale to locals here in Raglan, and everyone loved it. Our business was born! We are now both almost 100% dairy-free and feel really good without it in our diet. 3. What are the health benefits of consuming yoghurt? How to choose the best yoghurt? Coconut yoghurt is a great source of plant-based fats, which help to keep your skin and brain healthy, and also a good source of probiotics for gut-health. Because it’s so creamy it keeps you full for longer than the sugary, low-fat yoghurts, and you don’t need to eat so much of it. Try to avoid buying ‘skim’ yoghurts as these usually have lots of added sugars. Also avoid yoghurts that use heaps of gums, gelatins and thickeners. 4. What are some of the challenges that you have encountered when you develop Raglan Coconut Yoghurt and how do you overcome them? Oh goodness, where do I start! When we started we knew absolutely nothing about running a food production business. We had to learn all about food safety processes, microbiology, figure out packaging, hiring & training, shipping, managing logistics. It has been a big learning curve for us and all moved so fast. We produce all our products here in Raglan in a factory we’ve built, so we are involved in the full process from production, to packaging, to shipping. Challenges are best overcome with an open mind and a positive attitude. 5. What differentiates Raglan Coconut Yoghurt from the rest? We are frequently told by customers how our yoghurt is the best tasting one they’ve ever tried, it has a fresh, authentic taste that comes from using quality ingredients and careful production. We stay away from using lots of additives and sugars to make the yoghurt, and use fruit puree and natural fruit juice to bring out the flavour instead. We also choose to package our yoghurt in glass jars rather than plastic as it has a very high recycling rate and is better for the environment. 6. How does Raglan Coconut Yoghurt ensure only the best for its consumers? We only make products that we’re proud to eat ourselves. We are health conscious people and care about what we are putting in our bodies. The quality of your fuel determines the quality of your lifestyle, so we have this top of mind when developing new products. 7. On a personal note, how do you maintain a healthy lifestyle? 8. Lastly, any interesting things about Raglan Coconut Yoghurt that you would like to share with our readers? 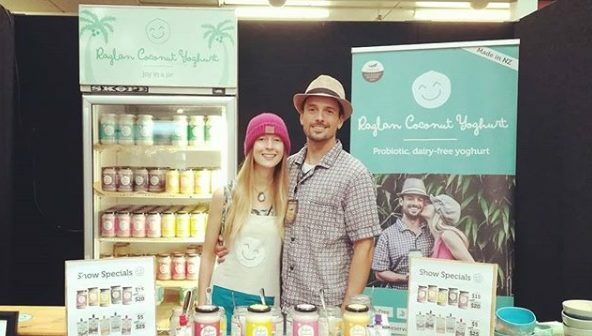 What are the next steps for Raglan Coconut Yoghurt? We always have a lot of different projects on the go to try and help the planet, the current focus is collecting 1 Million Pieces of plastic from beaches – we’ve had nearly 80,000 collected so far, more info here – http://raglancoconutyoghurt.co.nz/one-million-pieces-of-plastic/. We are also a Living Wage employer to make sure our staff are looked after. At the moment we’re working on two new delicious flavours to launch in the New Year, watch this space! Thank you Tesh Randall and Seb Walter for taking our interview! 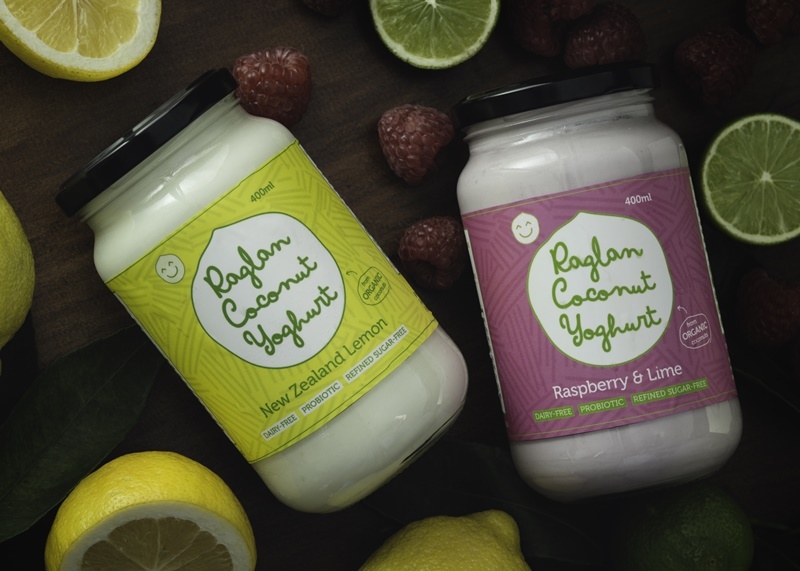 Founded in 2014, Raglan Coconut Yoghurt is an organic coconut yoghurt brand that originated from New Zealand. Since its inception, it can now be found in over 600 stores and cafes in New Zealand and Australia, and is a firm favourite amongst families. And is also suitable for people who are on a paleo or vegan diet.